29 1/2 x 42 in. 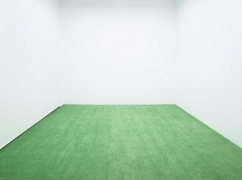 James Cohan is pleased to present My business is circumference, Spencer Finch’s second solo exhibition with the gallery. The exhibition will open on Friday, October 14 with a reception from 6-8 PM, and will be on view through November 26 at the gallery’s Chelsea location. 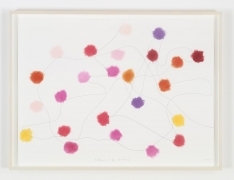 Spencer Finch has devoted his career to exploring the mysteries of perception and the natural world, embracing the transcendence of quiet moments – a breeze through the window or the play of headlights on his studio walls at night, sublime in their transience and subtlety. Finch uses precise instruments such as light meters and anemometers as well as his own crooked perception to re-create these experiences in varied media. He employs a scientific approach to emphasize rather than refute the importance of subjectivity. Natural phenomena may be methodically measured, but our individual experiences always diverge. The works in this exhibition, which include three installations as well as a collection of works on paper, make the viewer eminently aware of their surroundings and the ubiquity of nature’s small wonders. 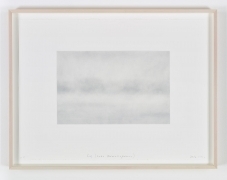 The elusive qualities of light have been central to Finch’s practice for the past decade and the installation in the first gallery, Summer Afternoon (passing cloud), continues this aesthetic investigation. 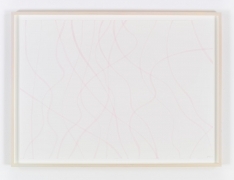 Finch re-creates the effect of a cloud passing across the afternoon sun, charting a shifting narrative of light, varying in color and intensity, that subsumes the gallery. 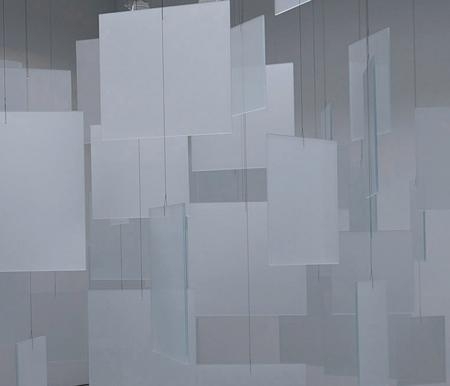 Spatial perception is a crucial element of the largest installation in the exhibition, Thank You, Fog, which uses 85 hanging glass panels and muted grey walls, to suggest the experience of looking through fog. 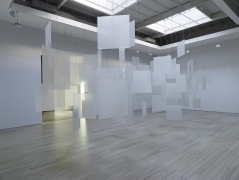 The panes of glass, which vary in their translucence, hang at different heights and various concentrations throughout the room to mimic the fluctuating opacities and movements of mist. A comprehensive view of the room is not possible from any point, but the panels create many possible sightlines, increasing the viewer’s spatial awareness. Fog can both conceal and reveal, like how the shape of a mist-draped mountain or forest may be clarified rather than obscured by a settling cloud. The installation in the third gallery Yellowstone Hike (from Lily Pad Lake to Artist’s Point), is a visual record of a hike Finch made in Yellowstone National Park in August of this year. 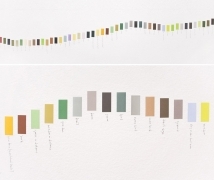 Finch matched the precise color of various objects along his path using a Pantone color book. The resulting installation is a sequence of 340 ready-made Pantone chips affixed directly to the wall, which vary in height to reflect the changing elevation of the walk. The colors are placed next to penciled labels, referencing the sights he encountered during the hike. 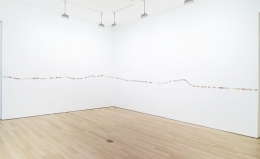 Finch installed a similar work, Ulysses, at the Marfa Contemporary in Texas last year after completing a day-long walking sojourn throughout New York, which has been transformed into a newly published artist book of the same name. In this new work, Finch trades urban wanderings for a reengagement with a distinctly American landscape. 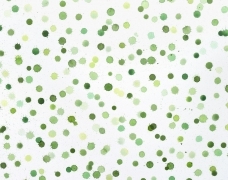 A collection of new works on paper is also on view, including watercolors that distill spring into thousands of different shades of green and pencil and pastel drawings that trace the paths of bees through a garden. 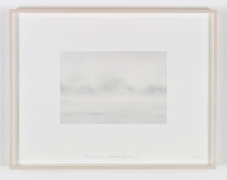 Furthering his study of fog, four of these works on paper are pastel drawings of a fog-covered lake in Connecticut. 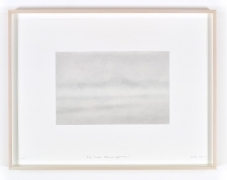 Influenced by James McNeill Whistler’s paintings and lithographs of fog, these nuanced works reveal an important tenant of Finch’s art and philosophy; the most important things are often veiled and hidden, waiting to divulge their earnest beauty to the careful observer. The title for this show, My business is circumference, comes from a letter that Emily Dickinson wrote to Thomas Wentworth Higginson in July, 1862. Finch is a longtime Emily Dickinson groupie. Spencer Finch (born 1962, New Haven, Connecticut) has had extensive international solo exhibitions and projects including Lost Man Creek, his project with the Public Art Fund on view at MetroTech in Brooklyn through 2018; Trying To Remember the Color of the Sky on That September Morning (2014), a special commission for the 9/11 Memorial, New York, NY; A Certain Slant of Light, The Morgan Library & Museum, New York, NY (2014) and other exhibitions at the Turner Contemporary, Margate, UK (2014); Rhode Island School of Design Museum of Art, Providence, RI (2012); the Art Institute of Chicago, IL; Museum of Contemporary Art San Diego, La Jolla, CA (2011); the Emily Dickinson Museum, Amherst, MA (2011); Corcoran Gallery of Art, Washington, D.C. (2010); Frac des Pays de la Loire, Carquefou, France (2010); Queensland Gallery of Modern Art, Brisbane, Australia (2009) and Massachusetts Museum of Contemporary Art (2007). 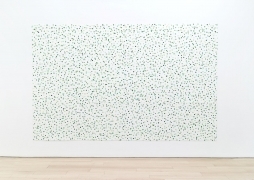 Finch was included in the 2004 Whitney Biennial and the 53rd International Art Exhibition, Venice, Italy (2009). 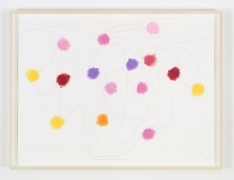 His work can be found in many collections including the Hirshhorn Museum and Sculpture Garden in Washington, D.C.; the High Museum of Art in Atlanta, GA; the Museum für Moderne Kunst in Frankfurt, Germany; The Kemper Museum of Art, St Louis; the Museum of Contemporary Art in Chicago, IL; the National Gallery of Art, Washington, D.C.; the Solomon R. Guggenheim Museum in New York, NY; and the Whitney Museum of American Art, New York, NY. Spencer Finch lives and works in Brooklyn, New York.